Instantaneous industrial relay conformint to CEI international standards. 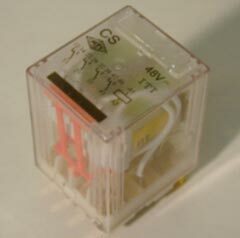 CS relay is equipped in its standard version of : a locking system with elastic clips located on the basis and clasps on the cover, two hexagonal withdrawal clasps permitting up to 36 possibilities, a removable label-holder on front face and a mechanical indicator. Min. nominal voltage AC 220 V 380 V - 50 Hz.
. CS relay with internal protection by Gemov or diode.